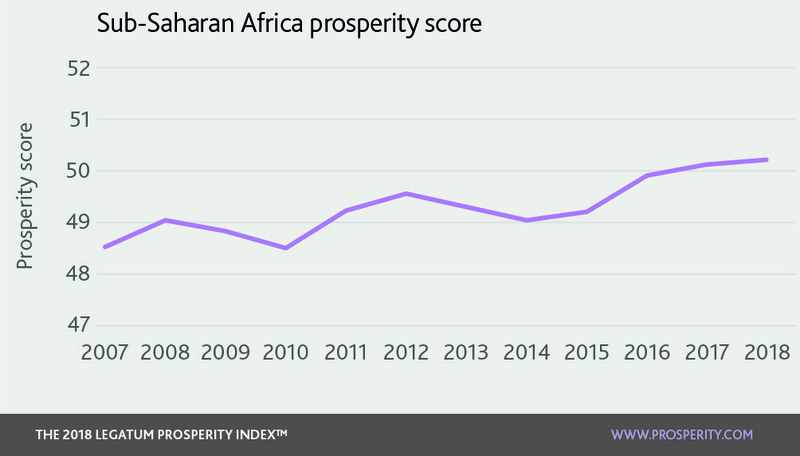 Prosperity in Sub-Saharan Africa increased slightly this year, continuing the trend of gradual improvement over the past decade. The gap between the rest of the world, however, is larger than in 2007, and the region remains the weakest performer. 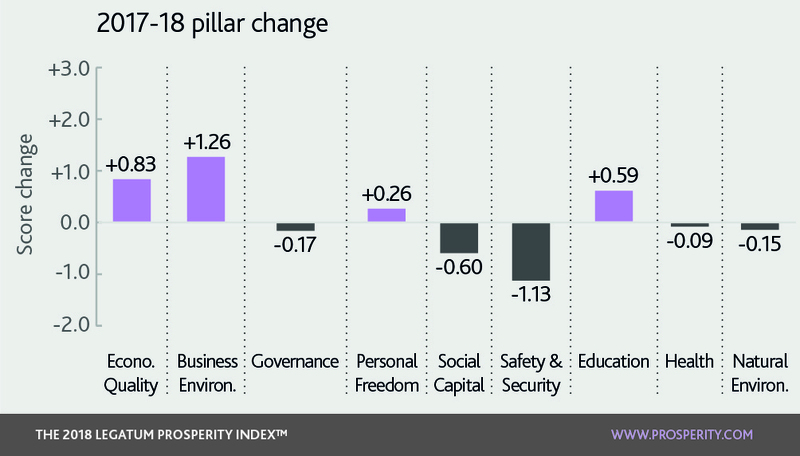 Over the course of the past decade, 35 countries in the region increased their prosperity. There was mixed success for individual countries last year, with 20 countries improving their prosperity and 20 countries seeing it decrease. The region as a whole has grown strongly in the Business Environment pillar over the past decade, in particular in the entrepreneurial environment sub-pillar, where it is now the third highest scoring region. There has also been an improvement in the access to credit indicator. Malawi and Cameroon were the world’s largest risers in the pillar overall. Even with a decline last year, Sub-Saharan Africa performs strongest relative to the rest of the world in Social Capital, and is the third-ranked region. Safety and Security in the region fell in the past year, continuing its downward trend. Sub-Saharan Africa is the least safe region in the world, and has been since 2007. Rwanda has seen the largest improvement in Business Environment over the past decade, by instigating several business reforms. These include reducing the time to start a business, accessing credit and strengthening investor protections. Rwanda also performs well in the Governance pillar, placing third in the region and top worldwide for female parliamentarians (61%). This is an area the region as a whole is strong in, ranking third out of all regions. Kenya, as the second-highest ranking country in Social Capital in the region, ranks third highest in the world for volunteering and 20th for voter turnout. South Africa is the second-highest ranking country in the region for Personal Freedom, which scores well for legal rights for LGBT relationships and government restrictions on religion have gone down from last year. Ghana is the second highest performer in the Economic Quality pillar in Sub-Saharan Africa. Ghana has improved in this pillar over the past year with improvements in its export quality index, a reduction in its trade barriers and a reduction in absolute poverty, causing a rise of 18 places to become second only to Mauritius in Sub-Saharan Africa. Ghana also has a 77% labour force participation rate. Namibia performs well in several indicators within the Natural Environment pillar; for instance it is seventh overall for protected land area with 38% of its area conserved. In 1990, it was one of the first African countries to incorporate environmental protection into its constitution. In the 21st century, Sub-Saharan Africa will have the fastest growing population in the world. By 2050, there will be an additional one billion Africans on the planet. There are potentially enormous economic gains to be made from such a youthful, growing population. With a median age in 2012 of just 19 years, Sub-Saharan Africa has the opportunity to benefit from the demographic dividend, a boost in economic growth that occurs when there are growing number of people in the workforce relative to their dependents (the children and elderly). But making the most of this opportunity requires ensuring that Africans move into meaningful and productive employment. One important area where Sub-Saharan Africa lags behind is in the human capital of their workforce, which is the stock of skills and knowledge of adults in the economy. Sub-Saharan Africa falls a long way behind other regions in our Education rankings, and it performs worst in human capital. For example, the average working-age African has just 1.5 years of secondary education, compared to 3.0 in MENA and 3.4 in Asia. The adult literacy rate is just 60%, compared to 80% in MENA and 83% in Asia. Today’s human capital is largely the result of yesterday’s education and training system. Education is fundamental to prosperity, not only for its ability to enhance a fulfilling life, but for the productive capacity of the nation, which is limited by the skills of its citizens. Countries in Sub-Saharan Africa face the dual challenge of increasing both access to education (the number of children in school and the length of their time in school), and improving the quality (what, and how much, students learn while at school). In recent years, there has been some improvement in the number of children attending school. The numbers of children completing primary school has increased from 59% to 69% since 2004. Further, the number of girls attending school has also increased. However, the problem of under-enrolment remains, particularly at secondary level – a recent Global Education Monitoring Report by UNESCO said that 58% of Sub-Saharan African 15-17 year-olds are out of school.2 The proportion of children attending primary school is also low, at just 69%, compared to 94% in MENA and 97% in Asia. Further, while youth literacy has improved to 71%, it still falls far behind MENA (92%) and Asia (93%). The Global Education Monitoring Report suggested four key ways to increase the number of children in classrooms.3 Firstly, they propose extending compulsory education to nine years and beyond. Many Sub-Saharan Africa countries have compulsory education that lasts six years or less. Extending compulsory schooling particularly improves enrolment for the most disadvantaged, which would help reduce inequality in educational outcomes. Secondly, the report makes the case for tackling child labour so that children can attend school. Thirdly, UNESCO argues for providing generous incentives for the poorest to continue education. The first step could simply be providing free education. For example, Benin saw primary school completion improve from 52% in 2007 to 81% in the latest year after abolishing school fees in 2007. But even where education is free, sending a child to school can impose economic costs on a family – so minimising those costs can reduce the opportunity cost for sending a child to school. Fourthly, the report suggests making secondary education more attractive to disadvantaged youth by providing tutoring or a more diverse curriculum. Increasing enrollment is necessary, but not sufficient, for improving educational quality and ultimately, a nation’s prosperity. Being present in a classroom does not guarantee educational outcomes. 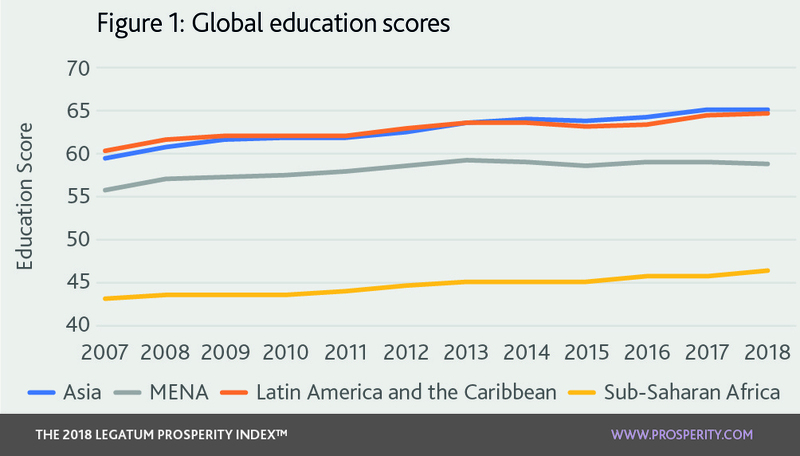 In the Index, the measure of education quality shows the region falls a long way behind. Out of the bottom 50 countries, 36 are from Sub-Saharan Africa. Another UNESCO study found that nearly 250 million children in developing countries were functionally illiterate, despite spending at least four years in a classroom. In recent leading international studies of numeracy and literacy, the average student in a low-income country performs worse than 95% of students in high-income countries.6 According to one benchmark, 60% of primary school aged children in developing countries fail to achieve minimum proficiency in learning. The World Bank identified three responses to the challenge of increasing education quality. The first is to measure learning by using a range of metrics to understand the effectiveness of policy and of teachers. This provides visibility on where the education system is failing, and helps to incentivise governments to focus on improving learning. There is already some positive focus on testing in the region. For example, 16 countries in the region are part of the Southern and Eastern Africa Consortium for Monitoring Educational Quality (SACMEQ), an organisation focusing on undertaking research that can be used to improve the quality of education in those countries. Second, this information on metrics and learning should be publicly available and used to drive improvements. As noted above, this region performs particularly poorly in education quality, and over the last 10 years, only six countries in Sub-Saharan Africa have improved their education quality scores. One way of improving quality could be the use of international comparisons or assessments. Third, governments should act on evidence: use proven interventions at the local and global level to improve learning outcomes. One important investment for educational quality should be in teacher quality. In a recent study of 14 Sub-Saharan African countries, the average grade six teacher performs no better on tests than the highest performing students in that grade. There is a further problem of teachers in Sub-Saharan Africa not turning up to teach. Improving teacher training and incentives is fundamental to improving outcomes. An important qualifier is that reform must be country-led. While international partners can be useful, overseas development assistance cannot play a dominant role in improving educational outcomes. Some of the most successful countries globally in education, such as Singapore (3rd in Education) and South Korea (17th), are those that improved education quality and quantity without overseas development aid. For Sub-Saharan Africa to succeed, education reform must be owned nationally. As well as falls in Safety and Security, Turkey has experienced a decline in Personal Freedom due to decreasing freedom of the press and reduced civil liberties.